Late last year, developer Panic Button worked wonders by transplanting id Software's hellish FPS DOOM to the Nintendo Switch. Visual downgrades aside, it was an incredibly accurate conversion of relatively recent AAA shooter, and proof that Nintendo's system – despite its relative lack of grunt when compared to Sony and Microsoft's home consoles – was capable of handling visually intense multi-format releases. Unsurprisingly, it established Panic Button as one of the Switch's most exciting developers. Fast-forward to the present, and publisher Bethesda has once again entrusted Panic Button with porting duties for a second high-profile shooter: MachineGames' Wolfenstein II: The New Colossus. The result is yet another impressive entry on Panic Button's burgeoning CV, even if some of the concessions that have been made render it slightly less appealing than its home console iterations, which launched in October last year. The New Colossus follows on directly from the events of the 2014 title Wolfenstein: The New Order, which – if you're a seasoned Nintendo veteran – you may not have had the chance to play, as it was only available on Xbox One, PS4 and PC. The New Colossus does a commendable job of summarizing the events of that game in its introduction sequence – it even allows you to relive a distressing (but important) choice which impacts the narrative of the sequel you're about to play – but it's a real shame that Switch owners have to jump into this one totally cold, as you're missing out on vital character development that gave The New Colossus some of its most emotional (and shocking) moments. Stepping into the boots of William Joseph 'B.J.' Blazkowicz, you find yourself crippled and wheelchair-bound aboard the stolen Nazi U-boat Eva's Hammer. You've been in a coma for months following the catastrophic conclusion of The New Order, but your respite is cruelly cut short by an attack by the unhinged Frau Engel, a key protagonist from the first game who has good reason to want your head on a stick. It's a brave move to place the player in the role of a character who has limited movement from the off, but it sets into motion a breakneck pace that doesn't let up, even as you hijack Nazi flying fortresses, plan a revolution in the ruins of Manhattan and stalk through the slums of New Orleans. The storyline veers from utterly shocking to hilariously silly in the blink of an eye, but it's a mix that somehow holds together – thanks in no small part to some excellent scripting and stellar voice acting, especially on the part of the gruff-voiced Brian Bloom, who turns the previously one-dimensional Blazkowicz (lest we forget, his tour of duty began way back on 1992 in Wolfenstein 3D) into a relatable hero. It's also impossible to deny the satisfaction one can gain from taking down hordes of nasty Nazis, and the game never shirks from giving you an opportunity to enact revenge on members of the hated Reich. While your path through the carnage is largely a linear one, the environments are usually big and maze-like enough to encourage you to consider a different strategy to the tried-and-tested 'all guns blazing' approach. Nazi officers will signal for help when alerted to your presence, which means that silent takedown kills – executed by pushing the 'R' stick down when in range of an enemy – are preferable, especially when you're low on health and ammo. Of course, there are moments when stealth simply isn't an option, and it's here that the game's superbly-crafted gun-play becomes apparent. All of the weapons – from the smallest pistol to the largest laser-spewing rifle – have a lovely heft to them, and projectile-filled battles with streams of Nazi soldiers – all of who will try to use cover intelligently and outflank you – are never anything less than thrilling. The opportunity to dual-wield certain weapons adds to your destructive power. DOOM on Switch was vastly improved by the addition of motion controls, and thankfully The New Colossus is blessed with these from the very start. Nintendo fans who lived through the Wii U era will already know what a difference motion-aided aiming can make; it almost feels like having a third analog stick with which you can fine-tune your shots. We honestly don't know if we can go back to standard single-stick aiming after playing this; it's that good. What's truly remarkable about Panic Room's Switch port is that despite a blindly obvious downgrade in visual fidelity, the action is faithful to that seen in the other versions of the game. The developer has wisely decided to sacrifice detail for responsiveness and speed, and as a result The New Colossus on Switch runs at around 30fps at all times. Lighting effects and motion blur help mask the much-reduced pixel count, and it would seem that Panic Room has employed dynamic resolution scaling to help Nintendo's console cope with packed scenes. During slower moments, though, the cutbacks are plain to see – textures are muddy and everything lacks detail thanks to the lower resolution. In both docked and handheld mode, it often seems like you're playing The New Colossus through a thick film of vaseline, and if you've played the game elsewhere then the downgrade might be off-putting. On the plus side, the Switch's 720p screen does a good job of hiding these shortcomings, and being able to play such a recent AAA console game on the move is nothing short of a miracle; the main thing is that Panic Button has transferred the essence of what makes The New Colossus great to Switch successfully. There's sadly no multiplayer to speak of (there wasn't any in the original release, either) which means that once the end credits have rolled there's little reason to return, unless you fancy taking on one of the harder difficulty levels. 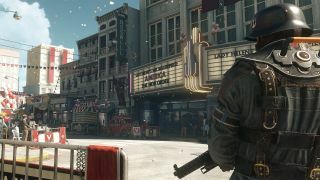 Wolfenstein II: The New Colossus is an incredible ride while it lasts, and proof positive that Nintendo's hybrid console is more than capable of hosting faithful ports of big-name third-party releases – even if some of the visual spectacle has to be dialed back in the process. The concessions made by developer Panic Button make sense in the grand scheme of things, and being able to blast away Nazis in portable mode is something of a game-changer – even if you've already experienced this adventure on PS4 or Xbox One.